Today i am down 1 pound from yesterday putting me at a total of 10 pounds since march 1st. M focus seemed to be better today and i got alot done. However, i felt dizzy for the first part of the morning until about 2. For about 2 hours i stubbled around a lot. I checked my blood sugar. I am not diabetic but i thought it would be interesting to check especially since i was light headed. It was 84, which is normal. That was also after i had a green breakfast smoothie. The smoothie did not help with my light headiness, but as the day went on it went away. Today, i had a strawberry, banana, spinach smoothie with vitamineral green and protein powder around noon. 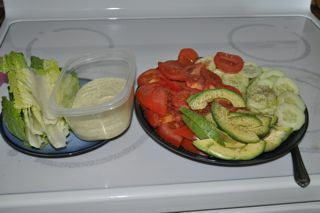 A couple hours later, i made hummus with romaine lettuce, cucumber, tomato and avocado. 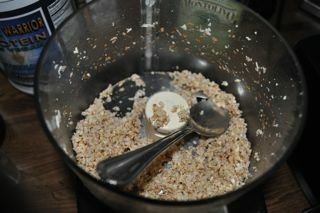 For dessert, i made almond coconut balls. They are crazy good, and my family was really in the mood for them, however, i did not have any since i was not hungry for them. Being on a raw food diet makes it so easy to not eat when i am not hungry. As a snack later, i had a banana and a pear. For dinner, around 9 because i was not hungry until 9, i had a couple tomatoes with avocado. Yum. This entry was posted on Wednesday, March 18th, 2009 at 2:41 am	and is filed under Raw Food. You can follow any responses to this entry through the RSS 2.0 feed. You can leave a response, or trackback from your own site.